1. Measuring range:COD: 5 ~ 2000mg / L, measured over dilution.2. Indication error: COD: Indication error ≤ ± 5%3. Repeatability: ≤ 3%4. Anti-chlorine interference: ≤ 2000mg / L5. 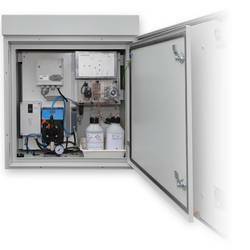 Temperature control system: room temperature ~ 180 can be set, COD digestion temperatureis 165 . UNIPHOS 350M-Phosphine Alert PH3 Lo Gas Monitor For detection of PH3 at TLV level, for personal protection and safety. COD analysis requires digestion of samplers using pottassium dichromate and sulphuric acid, . Spectralab offers two models 2015M for 20 ml sample size and 2025M for 2-5 ml sample size. The digested sample is then titrated against FeS04 , for which Model CT 15 is specially designed. The MD 200 is a single parameter photometer for the measurement of COD. A waterproof (IP68) housing, high precision interference filters and LEDs used give robustness, reliability, accuracy and confidence in results.